"This is Utica, New York's specialty dish. 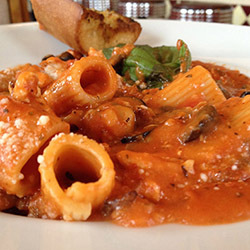 Rigatoni (riggies) pasta is paired with chicken and spicy peppers in a creamy red/white sauce. Some other popular additions are mushrooms and black olives."